The beautiful new Kino Lorber Blu-ray release Pioneers: First Women Filmmakers is a revelation, a six-disc set featuring dozens of early films created by women, many unseen for decades. One highlight is Lois Weber‘s innovative and aptly titled home invasion thriller Suspense (1913). As shown here, Suspense provides some remarkable views of early Hollywood at the dawn of the movie industry. A young mother, home alone (also portrayed by Ms. Weber) telephones her husband working late that a tramp is breaking into their home. When the tramp cuts the phone line, the frantic husband steals a car, pursued by the police, who all race furiously to reach the home in time. Above, the chase kicks into gear as the husband and then the police turn right (south) from Sunset onto Gower, with the Nestor Film Company studios in the background. The view looks north up Gower towards Sunset. 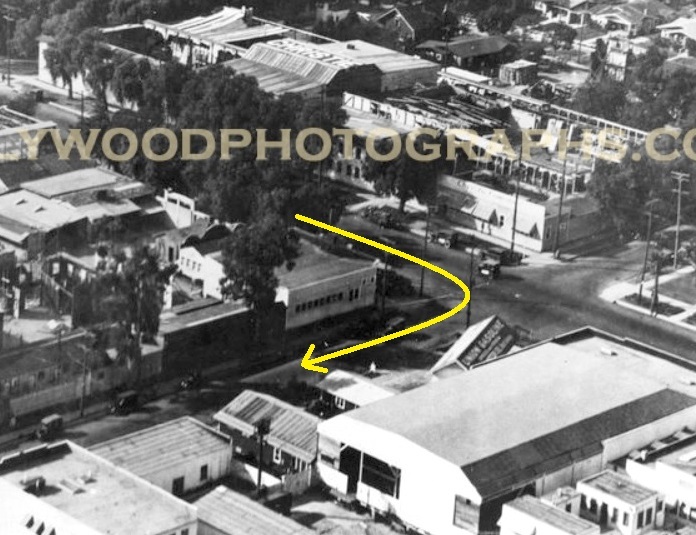 Nestor is credited as Hollywood’s first permanent movie studio. Nestor above, LAPL, the same corner turn right from Sunset onto Gower, at left, taken in 1922 HollywoodPhotographs.com. The corner Sunset-Gower street sign (oval) visible beside the Nestor Studio during the shot appears much more closely during this shot from One of the Bravest (1914), presented on YouTube by the Dutch EYE Filmmuseum. 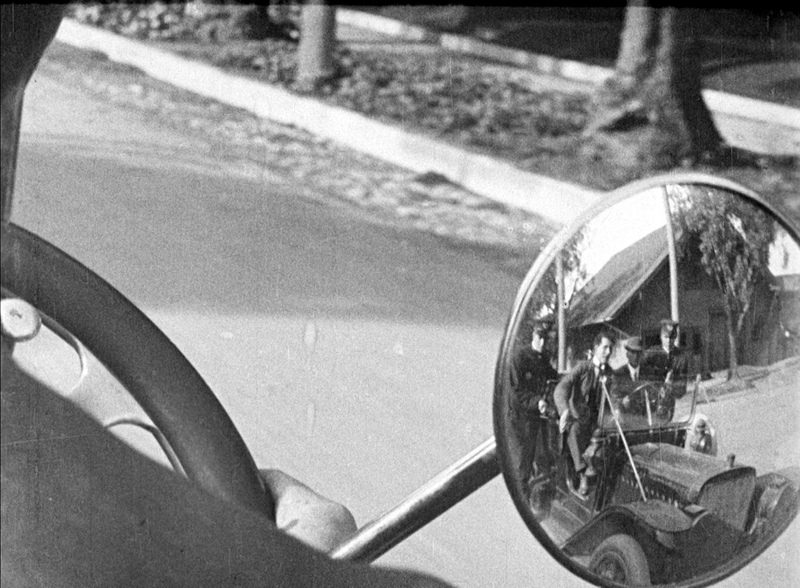 Suspense is noteworthy for its daring camera angles, triptych scenes of the husband, wife, and burglar, inter-cutting between the tramp breaking down doors and the cars racing home, and inventive shots such as here, where the cops chasing the husband appear reflected in his side view mirror. 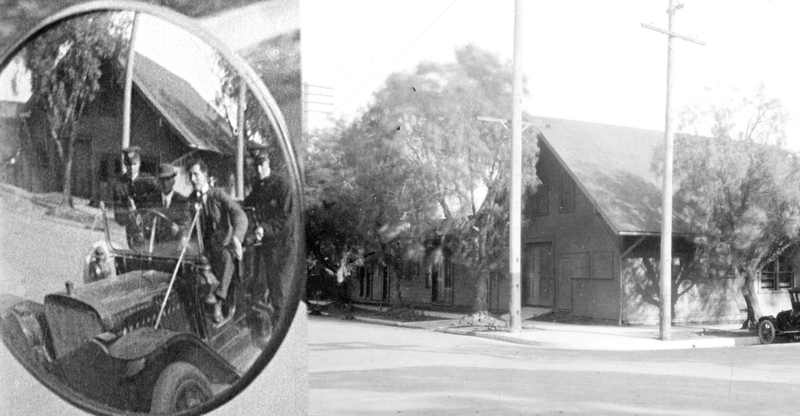 Thanks to the Blu-ray image quality in this new release, we can see that the Lasky-DeMille barn, at the SE corner of Vine and Selma, appears reflected in the mirror as the crew raced north up Vine. Above, reversing the movie frame for comparison clearly matches this historic view. After Lois Weber filmed here, in December 1913 Cecil B. DeMille, working with Jesse Lasky, leased the barn for the production of The Squaw Man (1914), known as the first feature film produced in Hollywood. 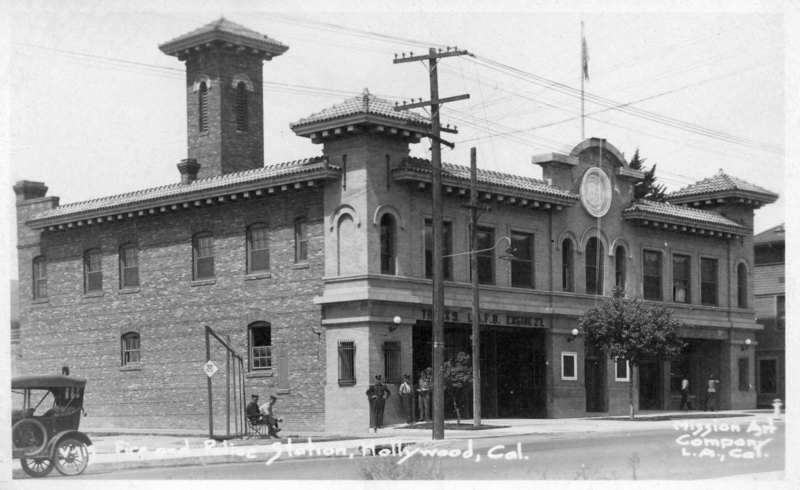 The “Barn,” home to the Hollywood Heritage Museum, now stands on Highland Ave. across from the Hollywood Bowl. Marc Wanamaker – Bison Archives. Click to enlarge – 1919 – looking NW – the arrow runs north up Vine crossing Selma beside the Barn and the rest of the Famous Players Lasky Studio to the right. The next street up with the corner church is Hollywood Blvd. The large white home surrounded by trees, to the left of the cropping mark, is the Jacob Stern estate. Marc Wanamaker – Bison Archives. 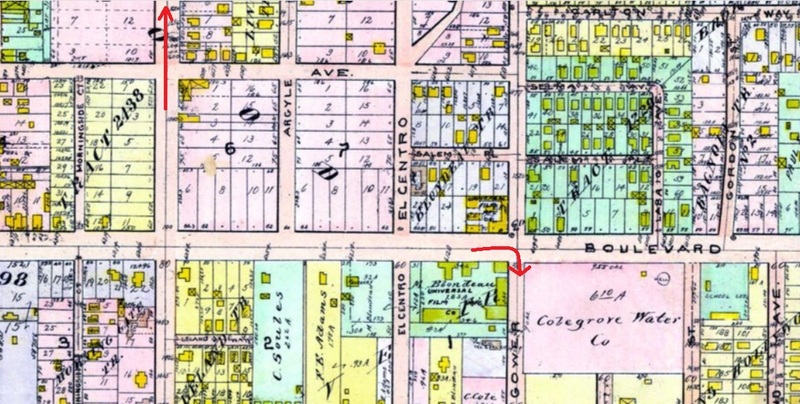 Above, this 1914 Baist Atlas map shows where the chase first turns right from Sunset onto Gower (right arrow), and then north up Vine past the Lasky-DeMille Barn on Selma (left arrow). Next, during his frantic race home, the husband hits a tramp pausing in the middle of the road to light a cigarette. As we’ll see in part two of this post, this scene and the movie’s dramatic conclusion were filmed in Beverly Hills, where Sunset bends left, south at Doheny Road, near where Charlie Chaplin filmed his tree disguise scenes from Shoulder Arms (1918) and Buster Keaton filmed newly rediscovered scenes from The Blacksmith (1922). LAPL. Stay tuned for more Suspense! 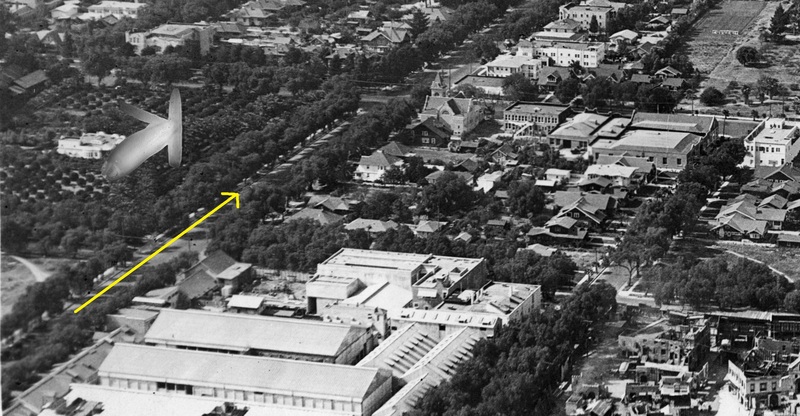 A related post shows how Weber and other pioneer women filmmakers filmed at the Chaplin-Keaton-Lloyd alley in Hollywood, years before the gents did. Kino Lorber Pioneers: First Women Filmmakers. Below, a matching view north up Gower towards Sunset today. This entry was posted in Hollywood History, Lois Weber and tagged Beverly Hills, Hollywood fire police station, Lois Weber, One of the Bravest, Pioneers First Women Filmmakers, Silent Movies, Sunset Boulevard, Suspense, then and now. Bookmark the permalink. Thanks John — this is fantastic — Now I want to see the entire set of films! As always, interesting. Helpful, too, since this post has helped to verify a thesis in my new book, which is partly about Atwater. But without taking away from Weber’s work – I must say that this film is very similar to films by DWG =- the bad guy even looks like one of the baddies in the Lonedale Operator which DW produced 2 years earlier. It seems that like so many early filmmakers, Weber is building on the work of others, apparently enhancing that with some innovative techniques.